lt;stronggt;NSN3982473lt;/stronggt;lt;BR/gt;NIB - NISH 7930013982473 Power Dusterlt;BR/gt;Blast away all dust, dirt and microscopic debris from hard to reach areas on computers, keyboards, printers and more. Formulated to keep equipment clean-- prolonging equipment performance and longevity. Cleaning is both safe and easy using handy trigger and extension tube. Leaves no residue, is ozone safe and the shelf life is indefinite.lt;BR/gt;lt;BR/gt;lt;stronggt;FEL49106lt;/stronggt;lt;BR/gt;NIB - NISH 7930013982473 Power Dusterlt;BR/gt;Get computer repairs done more easily with this essential tool kit Designed to fit every need from basic computer and peripheral maintenance to full-service repairs. Unique 2-in-1 nut socket offers metric and standard measurement sizes in one bit. Sizes include 3/16amp;quot;-5mm, 1/4amp;quot;-6mm, 5/16amp;quot;-8mm, 11/32amp;quot;-9mm and 3/8amp;quot;-10mm. 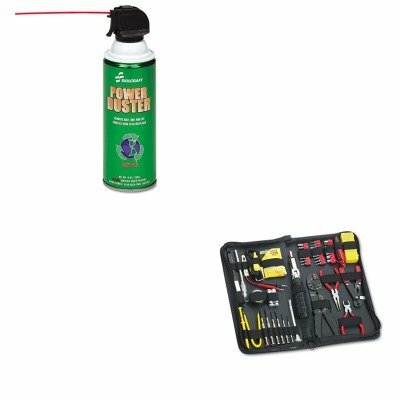 Kit also includes bit holder, fully flexible ratchet driver 3-way path and an assortment of screwdrivers, pliers and wire strippers. All tools are demagnetized to prevent damage to computers, peripherals and magnetic media. Conveniently stored in a vinyl zippered case measures 7amp;quot; x 13 1/8amp;quot; closed. Tool Kits Type: Computer Tool Kit Number of Pieces: 55.